Sideshow Collectibles have announced one of their exclusives for this year’s San Diego Comic-Con. There are a lot of R2 units across the galaxy, but there is only one R2-D2. Fresh off the factory line and available only as a special convention exclusive, the R2-D2 “Unpainted Prototype” Sixth Scale Figure is everyone’s favorite plucky little droid ready for a new round of adventures. Based on the R2-D2 Deluxe Sixth Scale Figure, everyone’s favorite astromech has been re-imagined as an unpainted prototype droid with a distinctive monochromatic silver finish. Equipped with hinged panels and articulated light-up dome, this unique limited edition exclusive will be an excellent addition to any Star Wars collection! You can order the figure now. Ript Apparel has three new designs! Bro, Do You Even Beep-Boop?, Sand Rider, and Need Caffeine, by Obvian, Harantula, and Theduc, are on sale today only! Get them before they’re gone! Bro, Do You Even Beep-Boop? Bluefin expands its line of Star Wars products with the release this month of the Egg Attack Star Wars series EA-015 R2-D2 statue and EA-016 C-3PO statue from Beast Kingdom. The statues are the latest to join Beast Kingdom’s line of officially licensed, collectible Egg Attack Star Wars figures that are available now from authorized Bluefin retailers nationwide and also from a variety of leading online outlets. The Egg Attack statues present extremely high quality, super-deformed renditions of several legendary characters from Star Wars. Depicted as the legendary droids appeared in the original Star Wars Episodes IV, V and VI film trilogy, the stunning renditions of R2-D2 and C-3PO are officially licensed by Lucasfilm and are constructed with compound materials. 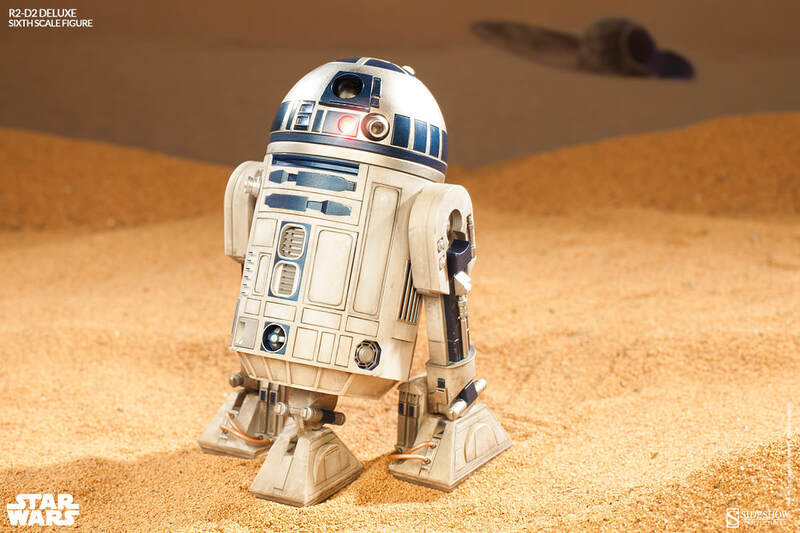 Their screen accurate paintjobs fully realize R2-D2’s classic blue and white plating and C-3PO’s gold armor, silver right leg, and his weathered appearance from the time spent stranded on the desert planet of Tatooine. This collectible statue is constructed with compound material and painted to reflect R2-D2’s classical blue and white plating. The lighting function of the droid 100% matches the original movie setting. It also has built-in R2-D2 sound effects officially licensed by Lucasfilm. To complete the display, a classic-looking Carbon-Freezing Chamber light-up figure stand is also included. This collectible statue is constructed with compound material and expertly painted to depict C-3PO’s gold armor, silver right leg, and the weathering effects from time spent stranded on the desert planet of Tatooine. It has built-in classic lines officially licensed by Lucasfilm, and also comes with a classic Carbon-Freezing Chamber light-up figure stand for collectors to customize their display. Going into this series, even the creative team must have known that Princess Leia would be a hard sell. She is a beloved character by most fans of Star Wars, but also in very few fan’s lists of favorite characters. Instead the relatively dour character is one that has fulfilled the role as the main heroine in a functional way, but not in a way that most people would ever really consider to be fun. Her role of main character has still often mostly been that of sidekick, and so a series about her own adventures might have seemed a bit out of place. That she was given a chance to shine on her own is a risk which has paid off for Marvel, the more so that these stories are considered to be official canon of the Star Wars universe. As the previous issue left off, Leia has promised to group together all Alderaanians who have survived the destruction of their home planet, and this has taken Leia to the extreme of exchanging herself for the traitor in their midst, Tula, the former agent for the Imperials. While the reader will know than Star Wars canon set between episodes IV and V featuring Leia means that the character has to live, her fate still feels very much in the danger as she steps into the hands of the Imperial officers, eager to rush her off to the fate which they think that she deserves. Things do not exactly transpire like this, but the end result is that Leia is able to somewhat fulfill her goal, even to a degree which she had not thought possible, moving beyond prejudice to find a commonality for all. Though it has been less talked about than the main Star Wars series, this series likely should have been. It got off to a slow start, but it picked up steam quite quickly, and the entire five issues story reads better together than monthly. With this final issue, it would also be nice to see the return of Evaan, the rare female character in the universe that is written like what most modern comic readers expect from a female character. 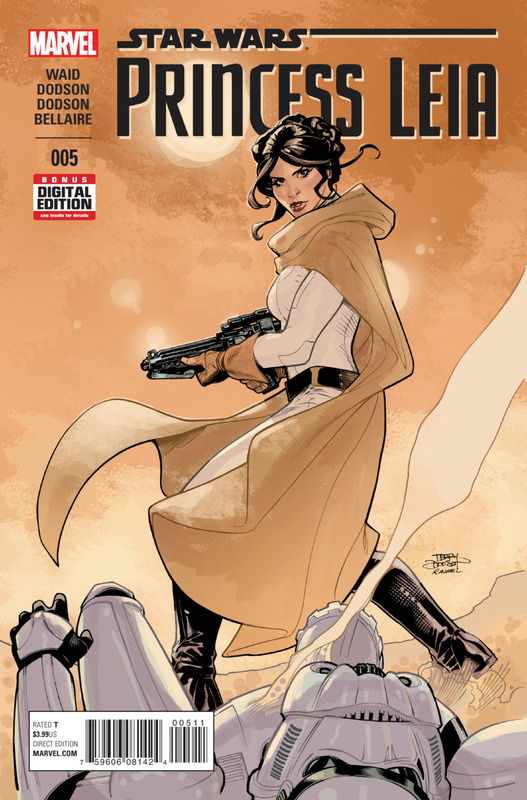 With this fifth and final issue, Leia proved two things as a character, first of all that she can carry a series, and secondly that she should probably given the opportunity to carry one or two more. When Marvel first announced that it would be releasing in continuity comics, fans get pretty interested. Perhaps the height of the point of interest was for the ongoing main series, set between episodes IV and V, which would help to fill in some of the blanks for the characters. So too were many interested in the Darth Vader series, presenting the complex villain as something more than just pure evil. It seemed though that many did not know what to make of the Princess Leia miniseries. As Geroge Lucas had conceived the concepts for Star Wars partially from the book “Hero of a Thousand Faces”, it meant that the princess was archetypal in many respects. That she was a princess but also often a damsel in distress. For the time she was maybe a strong female action lead, but through the modern lens she was shown to be somewhat dated. The series set off to change those conceptions, but it did not come fast. Another main problem with the character was that she was also among the less developed of the characters in the original trilogy, acting as a mostly unexplained parallel to Luke’s journey, though one with less focus. This meant too that this series took longer to establish itsself and its characters. The second issue saw the establishment of the Princess and her assistant/sidekick as credible players, but it is in this third issue where the two manage to come out looking like champions. It can be said that in some respects that there is more potential for female characters in fiction. As they tend to not have as much brawn to rely on, they are forced to rely more so on their brains, and that is the case here as Leia is led into a death trap, but then turns that to her advantage. 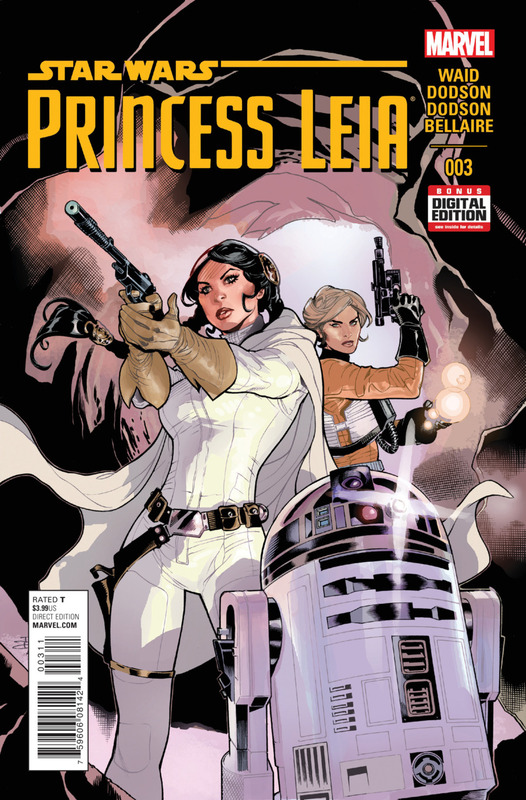 What follows is thus the strongest issue thus far of this series, and proof that the creative team was wise to go the route of using the Princess as one of its primary early focuses for establishing something more in the Star Wars continuity. There will be fans that will find this to be too much of a stretch from what came before in the movies, but this is also Princess Leia taken from the 1970s and dropped into the modern day. The end result is engaging and fun, and promises that the rest of this series will be a good ride. The price point on this bad boy is $149.99 and has a shipment date of December 2014. Go now, pre-order! There’s already one less available….. it’s mine! R2-D2!!!!!! At this point I think we need to start asking Sideshow Collectibles a very serious question. Is this really a sixth scale figure, or are they creating sixth scale DROIDS? This thing looks amazing. It has all the bells and whistles (probably not literally, I doubt it makes sounds) that an R2 fan could dream of. You get a lightsaber handle, hologram Leia, drink serving attachments, and so many other little bits and bobs. I’m trying to limit myself to 1 overly expensive toy purchase a year (what with bills and other grown-up stuff) and this little guy just might be it. Sorry Winter Soldier, you just got bumped. The Deluxe Sixth Scale R2-D2 will go up for Pre-Order “very soon” according to Sideshow Collectibles, so stay tuned. I’ll also keep you posted on my investigation into whether or not this company is developing real droids.